Relatively cheap fossil fuels allow everyone to enjoy comfortable lifestyles. But every so often, there seem to be horrible stories of environmental damage caused by our continuing addiction to underground hydrocarbons. Pulling oil, coal and gas out of the ground is probably going to be the way we get most of our energy for the foreseeable future, so it's just a bit worrying that we haven't quite figured out how to really mitigate oil spills and other accidents. Fortunately, Mother Nature hasn't taken full revenge (yet?) on us. We've talked about how the Olympics are so focused on hiding any non-sponsor brand that they had officials in Beijing during the last Olympics tape over bathroom fixtures from non-sponsoring companies. And it was clear that this same sort of activity was set to continue this time around in London, including a specific law against "ambush marketing." You may have heard the reports in London about the terrible security for the London Olympics that has left things in "absolute chaos," due to a failure to hire enough security personnel. In fact, there's talk of soldiers having to be called in to help. Given all that, it's interesting to find out that the Olympics do have a fully-staffed "brand police" force, which is heading around the city to carefully block any non-sponsor brands, and try to track down and kill off any kind of unpaid-for marketing. So, if a terrorist attack happens to hit London over the next few weeks, at least we'll know that it wasn't sponsored by some non-paying brand. Hindsight makes it easy to criticize decisions that were made that, in retrospect, seem foolish. The word 'tsunami' was coined by the Japanese, and yet a nuclear power plant apparently wasn't designed to fully withstand one (and an associated earthquake). Lots of folks have asked: "How could they not see this coming?" But it's not that simple, and a nuclear power plant isn't the only energy facility that can devastate the environment. Let's not forget the BP Oil Spill. As a reminder, here are some interesting links about the Gulf of Mexico and the still-unfolding aftermath of the Deepwater Horizon disaster. "Who cares, it's done, end of story, we'll probably be fine." Ah, yes. Now there's an email someone now wishes they had not written. The deaths, the images of oil-soaked birds, and the enormous environmental and economic tragedy they symbolize, are deeply painful. For people above a certain age, they likely trigger traumatic memories of another gigantic and horrifying oil spill, when the captain and crew of the Exxon Valdez tanker crashed in waters off Alaska and spilled millions of gallons of oil into the ocean. 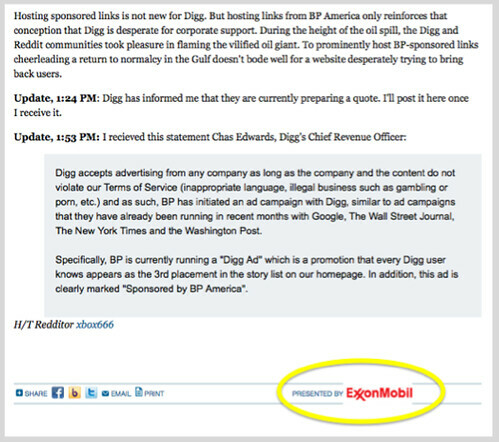 However, he then notes that the very same Atlantic article which mocks Digg for taking money from BP... happens to have been sponsored by Exxon: Edwards points out that there are always issues in ad-supported media, but the mocking tone was unnecessary and somewhat hypocritical given The Atlantic's own sponsorship practices. At times, we've had the same sort of debate here. Do we take advertising money from companies we disagree with over certain things? There's one argument that says that you should never agree to allow advertising from a company you disagree with. The flip-side might be that if a company you don't like wants to give it's money to you, perhaps you can put their money to much better use. In the end, I tend to view it in the same manner as I view censorship of unpopular speech: I'd rather let everything be out in the open, clearly stated, rather than trying to suppress views. When I was in Germany recently, speaking at an event, a German guy in the audience got up and read aloud a comment on Techdirt that said less-than-nice things about Germans, and demanded to know why I had not deleted the comment (noting that, under German law, I was legally responsible for those comments). Beyond the ridiculousness of German law that puts the liability on third parties for others' speech, I noted that free speech means allowing free speech for all -- and if that includes ignorant speech, it's better to let that ignorance out into the open where it can be countered and responded to, rather than trying to hide it and delete it. I said that blocking or simply deleting such speech only reinforces the ideas of those who make such speech that they're saying something so "truthful" the world can't bear to hear it. I don't think that pushes the conversation forward. 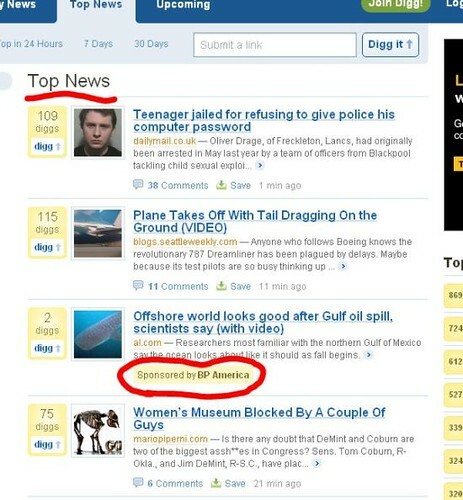 Now, obviously, advertising is not the same kind of "speech" as discussed in the paragraph above, but there is something to be said for allowing companies to advertise in an open manner, and allowing the discussion to then occur, even about that advertising -- something Digg tends to encourage openly. It's been said that the best response to speech you don't like isn't censorship, but more speech -- and I would argue that applies to advertising as well. Now, I'm sure some will cynically say that, of course anyone who accepts advertising will want to accept whatever ads they can to make money. But I think that sites like Digg, which have been pretty careful not to go down the road of really annoying advertising, show that they won't just do anything for money. Plenty of newspapers who covered the BP oil spill -- including the NY Times, the Washington Post and the Wall Street Journal -- all accepted advertising from BP in the wake of the spill. I didn't see any sanctimonious articles condemning any of them for doing so. It may be tempting, at a gut level, to suggest this is somehow "wrong," but I think I'd rather BP was out there trying to talk to people -- and letting the people talk back -- than being told it can't spend its money that way at all. Slashdot pointed us to this fun story about a scam artist who tried to get leniency from a judge by showing him photos of charity work he had done. The only problem? He Photoshopped himself into the photos and also forged letters from those charitable organizations. Not surprisingly, the judge didn't take too kindly to it, and gave him 285 months in prison -- 50 more than the sentencing guidelines allow -- because of the attempt to defraud the court. Of course, I was thinking of doing a post on just that, when Karl Bode pointed me to the news that BP has also been caught messing around with Photoshopped images. 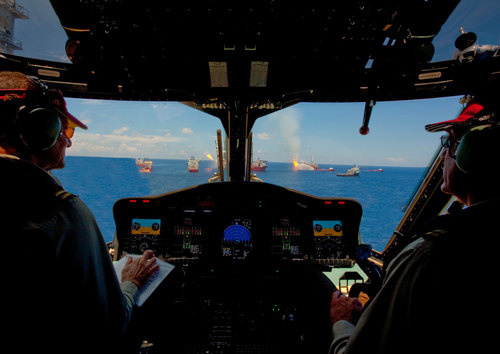 Apparently, the images that BP has released of its oil spill "command center" are really, really, poorly Photoshopped. 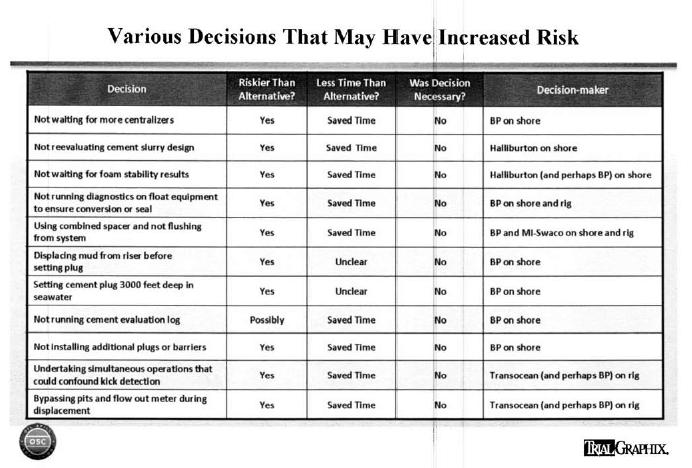 After being called on it, BP denied it, then sorta admitted it, but won't explain the details. Then, to make matters worse, it got caught with another Photoshopped image. So, whether you're a petty criminal, or a giant multi-billion dollar multi-national, perhaps you should layoff the Photoshop when trying to make yourself look sympathetic. Glyn Moody points us to the news that BP has apparently been hiring up a bunch of local scientists associated with various Gulf Coast universities to study the impact of the oil spill. While some might suggest at least BP should be paying for some of the analysis of the damage it has done, the details suggest that this is more about silencing the scientists. That's because part of the contract it's making them sign is an agreement that they won't publish or share their data for at least three years. That's generally not how scientists work. They look to share data with others and to publish frequently. When one university told BP it couldn't accept such confidentiality requirements, BP went elsewhere. In other words, it's pretty clear that this has nothing to do with actually understanding and letting the world know what has happened. It's about keeping it quiet for as long as possible.